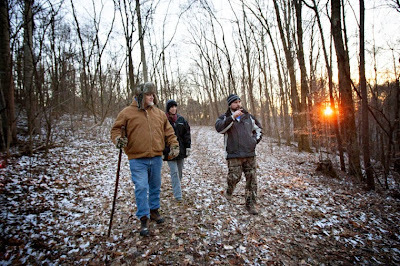 Charlie Raymond, of Prospect, Ky., (right) founder and lead investigator of the Kentucky Bigfoot Research Organization, leads a small team of people into the woods to search for Bigfoot, Friday, Jan. 3, 2014, in Barren County, Ky. The Daily News is a family-owned newspaper based in Kentucky. recently they have posted a photo essay of Charlie Raymond, founder and lead investigator of the Kentucky Bigfoot Research Organization. 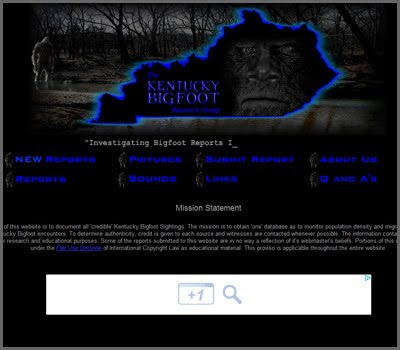 Fans of this site will remember our multiple posts about Charlie Raymond and Kentucky Bigfoot Research Organization. Most notable is when the KBRO took Larry The Cable Guy out Squatching. Charlie took Larry out Squatching and they even got some audio. Below, you can hear Larry do his own unique call at about the 3 minute mark and then you hear everybody freak out when they get a response. 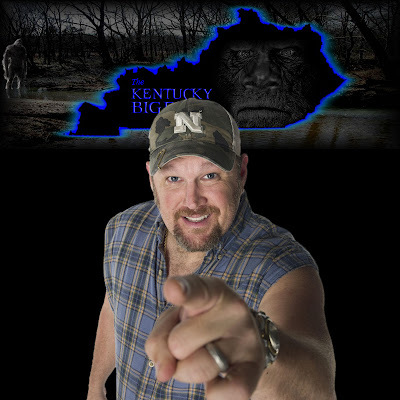 For a full transcript of the audio go to Larry the Cable Guy looks for Bigfoot in Kentucky. The Kentucky Bigfoot Research Organization has collected information on reported sightings listed in several Kentucky counties including at least three in Barren County, two in Allen County, two in Edmonson County, one in Hart County, three in Logan County and one in Warren County. 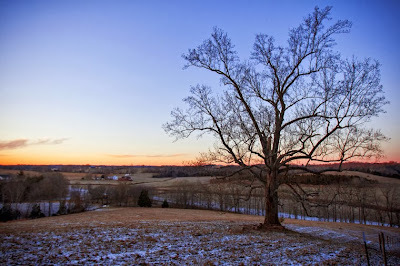 The excerpt and pictures below are part of the photo essay done by Kentucky's Daily News. Raymond, along with one of his researchers, his wife Dana, who calls herself a skeptic leaning toward belief in bigfoot, hiked into a wooded area several feet from the cedar thicket where the Barren County man said he had recorded the howl. 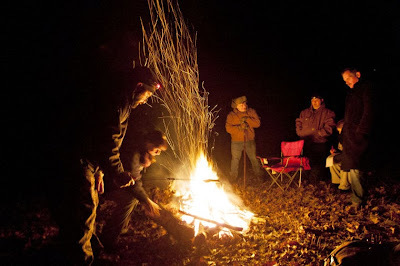 Dana Raymond built a fire and maintained base camp Friday night. Under a crescent moon, Charlie Raymond set out with two of his investigators, Renee and Terry Thomas of Georgetown, and two Daily News journalists on a hike through the hilly, wooded area to hunt for evidence of bigfoot, evidence such as a return tree knock or a howl. During a tree knock, Raymond takes a large stick and slaps it against the outside of a tree, creating a noise like a major leaguer knocking a fastball out of the park. If he’s lucky, he gets a knock in return, that is if a sasquatch is up for conversation. 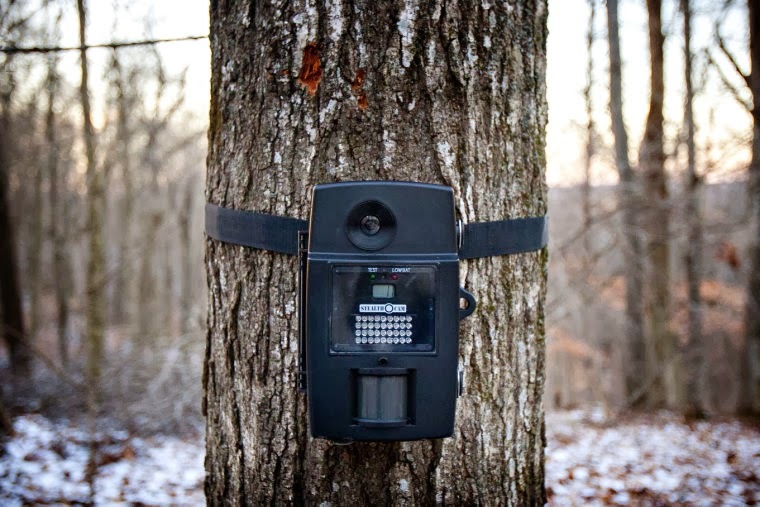 Raymond alerted his wife via two-way radio when he was about to conduct a tree knock or a howl so that she would know the sounds were coming from him rather than a sasquatch. One howl got a return high-pitched hoot back from an owl. 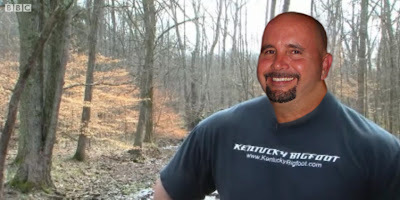 After traversing the private property in Barren County, Raymond led the team and visitors to a spot in Mammoth Cave National Park where he, his wife and a group of Girl Scouts got a scare last summer. While making howls and tree knocks with a giggling group of scouts, something large leaped onto the raised walkway in an area of the park, Raymond said. The leap created a thud so loud that the group hustled as fast as they could away from the area. Dana’s first thought was to protect the children from what could’ve been a bear or a bigfoot. Motion activated trail cameras are placed around the land attempting to snap a picture of Bigfoot, Friday, Jan. 3, 2014, in Barren County, Ky. 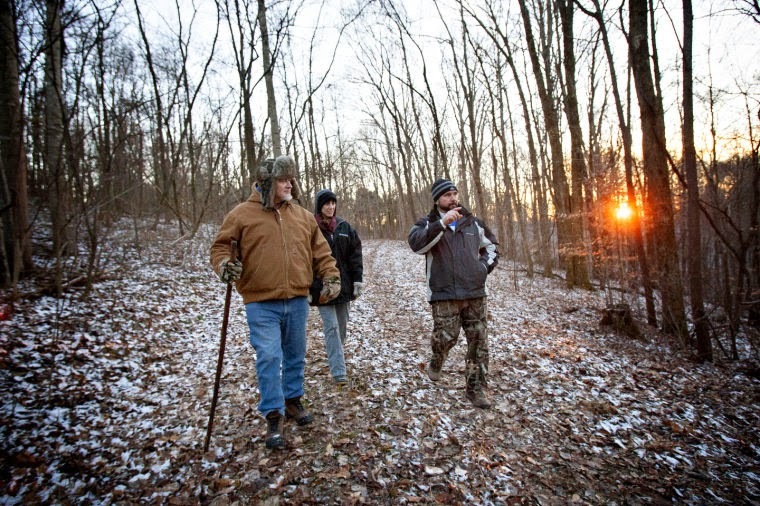 Researchers Terry Thomas, and Renee Thomas, both of Georgetown, Ky., and Charlie Raymond, of Prospect, Ky., (right) founder and lead investigator of the Kentucky Bigfoot Research Organization walk along a trail before searching for Bigfoot, Friday, Jan. 3, 2014, in Barren County, Ky. 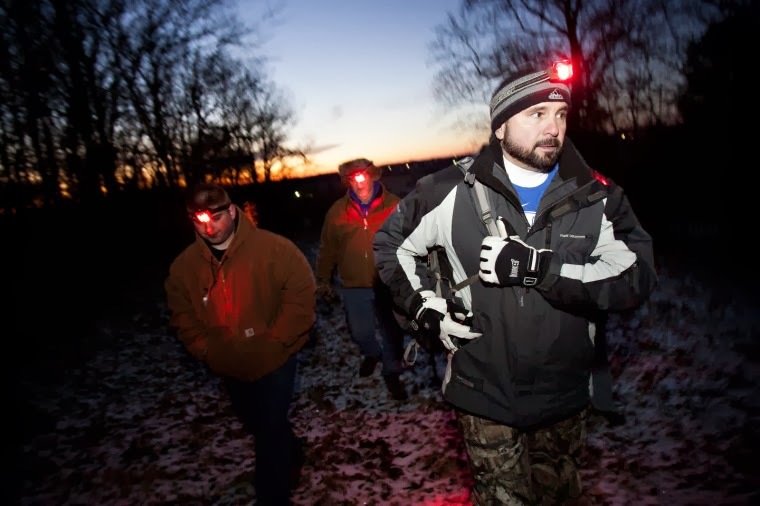 The sun sets before Charlie Raymond, of Prospect, Ky., founder and lead investigator of the Kentucky Bigfoot Research Organization leads a search for Bigfoot, Friday, Jan. 3, 2014, in Barren County, Ky. Researchers use red headlamps while searching for Bigfoot near a lake at Mammoth Cave National Park , Friday, Jan. 3, 2014, in Mammoth Cave, Ky.
People gather around a fire after searching for Bigfoot, Friday, Jan. 3, 2014, in Barren County, Ky. Forget Finding Bigfoot, It seems Charlie Raymond and his band of merry Bigfooters at Kentucky Bigfoot are our American Bigfoot representatives to our cousins across the pond. You may remember them escorting BBC news earlier this year, it seems the Irish want in on the action. More specifically, Seán Moncrieff, an an Irish broadcaster, journalist and writer. Moncrieff currently presents the weekday afternoon radio show Moncrieff on Newstalk. Tuesdauy's episode. Part of the show was slightly misrepresented at IrishTimes.com. You can read the recap below and listen to the interview yourself further down. In our opinion, and we are completely biased, Charlie did an excellent job fielding the predictable questions we have all encountered. You may want to fast forward to the 23:12 mark to get to Charlies Interview. Once again, we salute Kentucky Bigfooters, we are your biggest fans. Great job Charlie. Seán Moncrieff continued his speciality of drawing interesting information from the most ridiculous of sources. Tuesday’s unsuspecting subject on Moncrieff (Newstalk, weekdays) was Charlie Raymond of the Kentucky Bigfoot Research Organisation. The communication methods of Bigfoot (Bigfeet? ), we were informed, involve “tree knocking”. One Bigfoot will knock on a tree – an extremely loud noise, apparently – and another in a different part of the woods will respond. Raymond and his fellow researchers emulate this by bashing trees with baseball bats. “I’ve got immediately a reply back,” Raymond said. Moncrieff drew him out, asking how he knew it wasn’t another researcher hitting a tree – and “Bigfoot could be up some other place, clapping his hands”. No one can choreograph farce like Moncrieff zipping along with a series of Sunset Beach-esque cliffhangers before the ads kick in. “Up next, robot cats!” he declared gleefully as one’s about-to-switch-over hand dropped in defeat. Robot cats. Well, you’d have to give that a listen. Last month in a posts titled "Kentucky Bigfoot Gains Notoriety and Media Attention" and "Kentucky is where Bigfooting is at" we mentioned the uptick in Kentucky Bigfoot's visibility. Not only did they go bigfooting with Larry the Cable Guy, but they also had the opportunity to show BBC how bigfooting is done in Kentucky. You can watch the video and read the full article here. The complete text from the article is below. Not since footage emerged of a giant, ape-like figure in the California woods in the late 1960s has there been so much interest in proving the existence of Bigfoot. So how do you go about finding a creature most people believe to be a myth? It could be a human footprint. Let's not rule that out. Kentucky Bigfoot investigators pride themselves on their scientific rigour. They compile detailed reports, take copious notes, and rely on high-tech recording equipment to set their traps and document their work. Every twisted branch or broken twig is carefully examined for clues. Every distant sound in the trees seized on as a possible sign of "activity". FootprintWhich is how I came to be standing on the bank of a stream on a warm spring day staring at an indentation in the shingle. Someone had pointed it out as a potential footprint. It was certainly big enough. Maybe even too big. But as Charlie, our team leader, got to work with a tape measure, I assured myself that it was probably human. And that's when I knew they had got me. Probably is not a word I would have used a few hours ago, when we set out. Back then I would have said it was definitely human. But back then my scepticism was impregnable. Now it was starting to fray at the edges. Maybe this is how it starts. Yahoo-huntingPeople have reported seeing strange, ape-like creatures in the forests of North America for centuries. It's big and it was apparently made by a foot - but is it Bigfoot? Frontiersman Daniel Boone is meant to have shot and killed one of them. He dubbed the 2.5-m (8.2-ft) tall beast a Yahoo, after the creatures in Jonathan Swift's classic novel Gulliver's Travels. The Yahoo's descendants have come to be known as Bigfoot in some circles, Sasquatch in others. Whatever you call it, it is currently big news. YouTube is awash with "sightings". Most of them are obvious fakes. But what has really given new life to a very old legend is reality TV and its remorseless appetite for eccentric characters. It seems like every Sasquatch-spotter, from Canada to the Florida Keys, is in talks with a production company or has already been featured in a reality show of his own. Life-changing encounterWhen a TV crew arrives with a list of pre-planned shots and outlandish things for them to say, the Bigfoot-hunters generally play along. They know they are being held up to mockery, on some level, but they seem to be in little doubt about Bigfoot's existence. Joy, a middle-aged healthcare consultant, is the lead investigator with the Kentucky Bigfoot Research Organization. She says she saw Bigfoot for the first time last autumn. Or, rather, it saw her. As she was changing out of some wet clothes on a camping trip, she became aware of a hairy male face peeping at her under the tent flap, she told me. According to Joy, there was an overpowering odour. And she heard a low, guttural grunt. Whatever the creature staring at her was, it was not human. Joy's boyfriend, Ben, smiled as she told her tale. He is a Bigfoot sceptic - but it's a good excuse for a hike in the woods. Some native American tribes in the north-west of America believe the Sasquatch is real. Most think of him as a spiritual being, whose appearance before man is meant to convey some kind of message. One member of the Kentucky group told me he also thinks Bigfoot could be a spiritual manifestation. Bart Nunnelly has written several books on the mythical creatures that he believes live in the Kentucky forests. When he was nine, his family told a local newspaper they were being terrorised by giant ape-like creatures. He has been the subject of ridicule ever since. After all, there is little conclusive proof that Bigfoot is anything but a myth. Despite their emphasis on scientific fact, the majority of the group's evidence comes in the form of anecdotal bigfoot sightings collected on their website. The footprint we found, they decided, was most likely human. But Mr Nunnelly, like all the Bigfoot devotees I met in Kentucky, is not worried about the mockery of sceptics and non-believers. 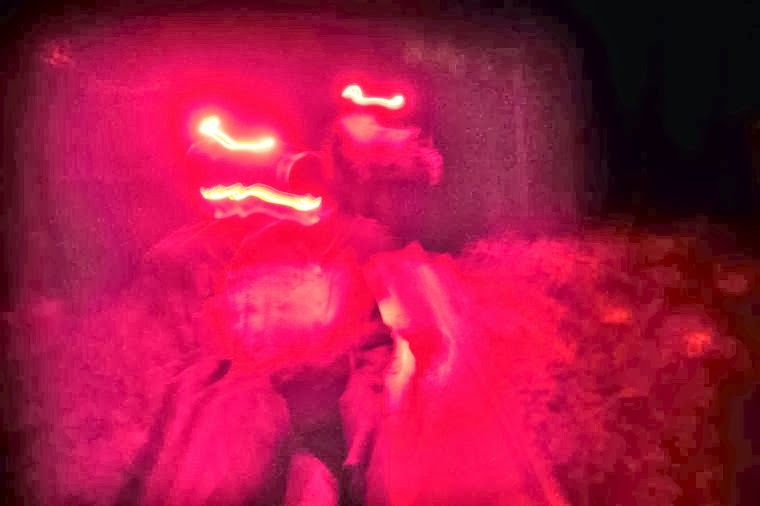 He seems certain about what he has seen, and that it wasn't human.